One year when my sister and I were children, we decided to grow a peanut plant as a fun — and from my mother’s point of view, educational — experiment. It was probably my first foray into gardening, and surprisingly, yielded an actual, although extremely unappetizing, peanut crop. Unfortunately, we didn’t know that post harvest peanut curing followed by roasting has to occur before they taste anything like ballpark nuts. Peanut curing in gardens doesn’t occur directly but only after harvesting. Peanuts, also known as goobers, goober peas, ground peas, ground nuts and earth nuts, are legumes that uniquely flower above ground but fruit under the soil. 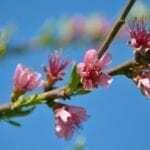 Peanuts are categorized by either nut variety (Spanish or Virginia) or by their growth habitat — either runner or bunch. Virginia peanuts are the type found at baseball parks around the country with one or two large kernels per peanut pod. Spanish peanuts have two or three smaller kernels and are often sold with a rusty red “skin” adhering to the outside of the nut. 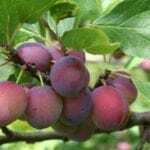 Both varieties require well drained soil. 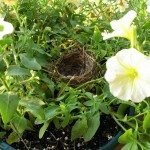 They should be planted after the danger of frost has passed, as they call for a soil temperature of 65 F. (18 C.) for germination. Sow the peanut seeds 1-1/2 inches deep, 6-8 inches apart. Space bunch types 24 inches apart and runner peanuts 36 inches apart. These warm season annuals take a minimum of 120 frost free days to maturation. The moisture content of a peanut kernel, once dug up, ranges from between 35 to 50 percent. This relatively high moisture content must be properly brought down to 8 to 10 percent through proper post harvest peanut curing. Improper curing will result in molding and spoilage. Harvest the peanuts once the foliage yellows in late summer to early fall. Dig the plant up carefully and shake the loose soil from the pods. Curing peanuts may then be accomplished via natural drying or mechanical drying. Commercial farmers use mechanical techniques for curing peanuts, but the home grower can air dry the nut. You can try peanut curing in garden sheds or garages or in a window indoors so long as they are warm and dry and humidity levels stay low. Hang the plant for one to two weeks in that location. 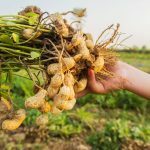 Damp or humid conditions will cause the nuts to rot, while overly hot or rapid drying will lower the quality, giving the peanuts an odd flavor and splitting the shells. Rain during the last days of curing will cause shell discoloration and potential mold and insect infection. Once the nuts are properly cured, peanut storage should occur in mesh bags stored in a cool, well ventilated area until you choose to roast them. 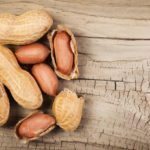 Peanuts do have high oil content, and as such, will eventually go rancid. 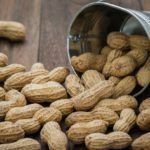 To lengthen the life of your peanuts, store them in a sealed container in the refrigerator for several months or in the freezer for several years.